AFC Telford have made three loan deadline-day signings by bringing in winger Sean Evans and strikers Andre Gray and Damien Reeves. Ex-Manchester United reserve Evans, 22, has impressed at Stourbridge this term, helping them to the FA Cup first round. Teenager Gray, 18, is a first-year pro at Shrewsbury, where he has made five substitute appearances this season. And former Leeds United trainee Reeves, 23, joins from Telford's Blue Square North rivals Alfreton Town. All three have been brought in to help aid Telford's goal-scoring problems. The Bucks are the second lowest scorers in the Blue Square North this season, having hit just 16 goals in 15 games. On top of Terry Fearns' abrupt exit in April, Andy Brown is nursing a groin injury, last season's top scorer Danny Carey-Bertram has managed just one goal this time around and Steve Thompson is yet to open his account for the club. The three new men are expected to go straight into 10th-placed Telford's squad for Saturday's Blue Square North trip to Farsley (28 November, 1500 GMT). Gray has been sent by Shrewsbury on a month's loan - "to get some valuable first-team football," said Town boss Paul Simpson. Evans, like Gray, started up the road at Shrewsbury in their Centre of Excellence before being spotted by United as a 16-year-old. 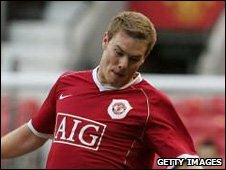 Having signed a pro contract in 2006, he worked his way up to United's reserve team, before being released from Old Trafford in July 2008. He then had trials with Inverness and Cheltenham before spells in non-League, first at Aberystwyth, then Cinderford Town, before joining his home-town club Ludlow Town. And, since impressing in Stourbridge's Cup run, he has also gone on trial with League Two strugglers Grimsby Town. Evans, who has dual nationality, was monitored by Wales during his days with United, but turned down the opportunity to be called up for Under-21 duty. Reeves joined Leeds at the age of nine, working his way up to the reserves. After 10 years at Elland Road, he had a spell at Barnsley and has since been at Wakefield, Farsley, Histon and Northwich before moving on to Alfreton in July. With three new arrivals, Telford boss Rob Smith has been able to release winger Danny Edwards on a month's loan to Halesowen.